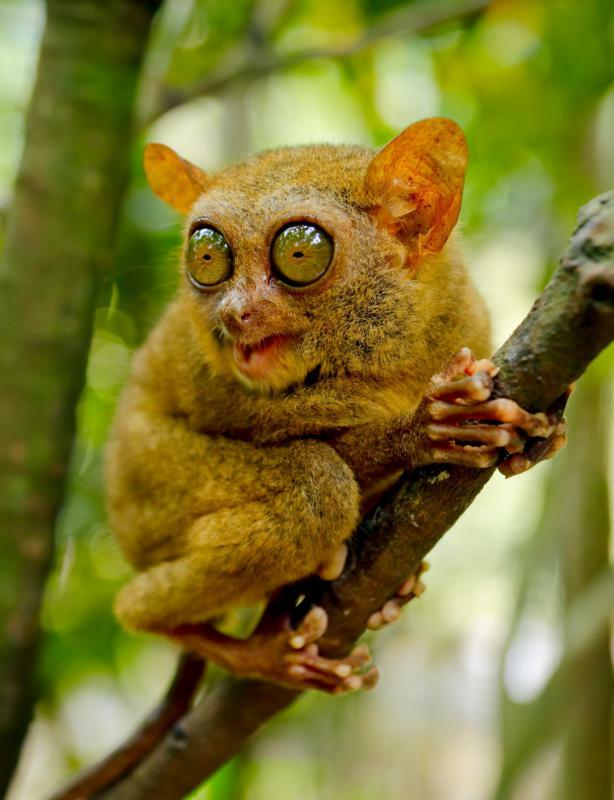 What Is a Philippine Tarsier? The tarsier is a small primate found in the Philippines and other areas of Southeast Asia. The Philippine tarsier is a small primate that lives in the forest areas of some islands in the Philippines. This tiny animal has a very distinctive look as part of the larger family of tarsiers. The Philippine tarsier also goes by the local name maumag or mamag. The scientific name is tarsius syrichta or carlito syrichta. In taxonomy, the Philippine tarsier is part of the family Tarsiidae, which dates back to ancient times. The disproportionately long ankle shows its inclusion in this mammalian family. The Philippine tarsier is arboreal, and the long ankles, along with other features, allow it to jump from tree to tree. This tiny animal has a unique face, partly because of its huge, bulbous eyes, which do not turn in the head. The head and body are round and squat. This tarsier species has developed digits, a gray or brown fur coat, and a furless, thin tail. The Philippine tarsier only grows up to about 6 inches (160 mm) long. The lifestyle of the tarsier is nocturnal, and this animal subsists on a diet of insects. The Philippine tarsier frequently scavenges insects from burned wood. It may also occasionally feed on larger fare such as small birds. In captivity, some research teams have reported that these animals have eaten seafood items like shrimp. The Philippine tarsier is now an endangered species. The specific category of its endangerment is not among the most dire, but its world population has decreased to a large extent. Advocates point to the destruction of its forest habitat as a main driver of its decreasing population. In addition to the destruction of the forests, there is the practice previously common in parts of the Philippines, of killing and stuffing these animals for sale. The stuffed tarsier was no doubt popular, but with the species headed toward extinction, the tradition has been banned. Instead, many visitors may want to see live tarsiers on nature tours of the Philippines. In terms of the actual relationship of the Philippine tarsier to other mammals, the idea has generated some controversy. While the tarsier has a lot in common with monkeys, others see this creature as being primarily related to the lemur family. In either case, this animal represents one of the smallest examples of primate form. What Are the Different Types of Tarsier? What Should I Know About the Philippines?